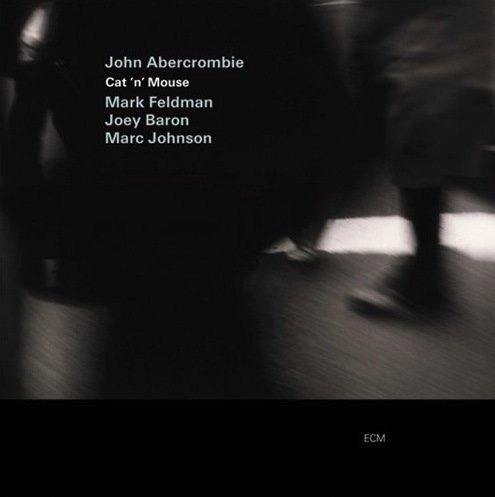 Cat ‘n’ Mouse introduces a streamlined quartet from the ever-extraordinary John Abercrombie. The guitarist is again joined by violinist Mark Feldman, whose peerless fluidity worked wonders on Open Land. In fact, the Abercrombie-Feldman nexus was what set the current project in motion, manifesting that former album’s title with even greater intuition. Flanked by longtime ally Marc Johnson on bass and drummer Joey Baron, the stage is set for a smooth ride through Abercrombie’s rich compositions and freer realization. Baron’s brushes wax slickly in the waltzing “A Nice Idea.” A blush of cordial introductions reveals the shifting combinations that color the album as a whole. Abercrombie matches Johnson so well that the two seem like brothers from a different mother, while Feldman brings most light to this play of shadows, floating above Johnson’s protracted bounces. Not all is lilt and whisper, however, for “Convolution” speaks to the session’s driving spirit. Using small motifs as stepping-stones, the quartet deconstructs the many paths ahead. Lapses of unity quickly disperse and shed their skins in favor of rhizomatic denouements. Abercrombie ignites the night air, while Feldman rocks the unison motives with panache. “String Thing” is another emblematic tune, bearing traces of producer Manfred Eicher’s suggestions to play without vibrato—that is, in a more “baroque” mode. The end effect is magical. Feldman and Johnson breathe in alluring simpatico, while Abercrombie’s steel-stringed acoustic brings a warm underglow to the ice. “Soundtrack” evokes moving words rather than moving pictures. Johnson’s pulsing solo and Feldman’s emotional edge say it all: life is romance. “On The Loose” is a diptych, annexing blues with a classic quick draw. The rhythm section here lights a bonfire, Feldman more than up for the swing. Noteworthy is Abercrombie’s pianistic roll in the tune. “Stop and Go” casts a Jerry Hahn vibe into the country and draws influence also from Feldman’s own six-year tenure in Nashville. Its jocular grammar evokes Bill Frisell, even if Abercrombie’s inflections speak their own language. Feldman is all over this one like blue on sky, opening to an explosive monologue at the center and sharing crackling follow-ups with Baron. A real knockout. Cat ‘n’ Mouse includes two entirely improvised pieces. “Third Stream Samba” harks to the Third Stream music of Gunther Schuller and, despite its title, is as far from Brazil as the sun. Its underlying rhythms are nonetheless engaging, spinning a world of diffusions from razor-thin bowing. Feldman is in his element in these open settings, dancing as much as crawling through the music’s evolving architecture. Neither is Baron afraid to whip up the dust here and there, as in “Show Of Hands.” The album’s closer takes its title from the drummer, who abandons his sticks in the final stretch and goes skin to skin. From the violin’s higher register it stretches a thin atmosphere, sounding like an ancient automaton creaking back to life. As the horizon whips its tail back toward the observer, Abercrombie flicks his lighter into the combustible air until all available oxygen spends itself.